This educational science animation on extensive and intensive properties of matter also contains detailed explanation of physical and chemical changes; the animation takes up each property and explains it elaborately. It clears away the confusion as to why pressure is an extensive but not an intensive property. What are the forces involved in the binding of matter ? Why stability of matter varies? Understanding physical changes that occur in matter on heating. The animation contains a visual explanation of why certain properties are considered as intensive and some as extensive, with many examples. Also dealt in detail are Physical and chemical change. This educational animation will clarify all doubts about properties of matter. 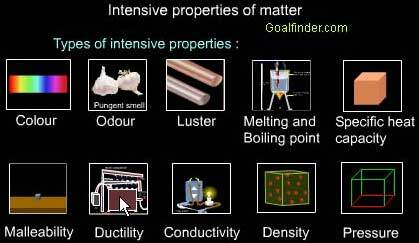 Intensive properties do not depend on the amount of the matter present. They are color, odor, luster, malleability, ductility, conductivity, hardness and softness, density, pressure, boiling point and melting point. Color: Perception of the different wavelengths of light. Odor: Property of perception of the sense of smell. Malleability - The ability of a substance to be beaten into thin sheets. Ductility - The ability of a substance to be drawn into thin wires. Hardness and softness- how easily a substance is scratched. Pressure: Force per unit area. The standard unit for pressure is the Pascal (Newton per square meter). Extensive Properties are those that depend on the amount of matter present. Mass - A measurement of the amount of matter present in an object. Weight - A measurement of the gravitational force of attraction of the earth acting on an object. It is given by product of the mass of the object by the acceleration due to gravity W = m × g. The SI unit is Newton (N) or kilogram-meters per second squared. Volume - A measurement of the amount of space a substance occupies. Volume is the space actually occupied by an object or the bulk of some substance. Length is the linear extent in space from one end to the other. The SI unit of length is meter (m). A change that affects the size, shape or color of a substance but does not affect its composition. Physical change is reversible and temporary. This type of change refers to a material changing to a completely different type of material or being transformed to a new substance. 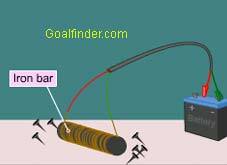 This process involves bond breaking and bond forming such that material changes its identity. E.g., wood burning is a chemical change. Ans: Size is related to volume, if the mass is increases as volume increases the density and buoyancy will generally vary little, but if volume increases with constant mass then density decreases increasing buoyancy, it also gives the load bearing capacity (determined by specific weight when density is multiplied by gravity). Ans: In case of both composition and physical properties, the criterion for separating element compound or mixtures into any of the three distinct types is very difficult, say in case color, odor, malleability, melting point, boiling point, density, mass, weight and volume, there are many overlaps for each criterion and you cannot distinctly categorize a substance into element, compound or mixture. In case of separation, mixtures are separable but elements and compounds are not.